Here's what I know: Simple creative + mindfulness practices change our lives. They get us through the tough stuff. They bring us joy. They help us make sense of these wacky, beautiful, sometimes really hard, incredible, messy lives we get to live. And in my new course, I'm sharing some simple, fun ideas to help you dive into the world of creative play with color to help us add in a little joy + connection to these last two weeks of February. Because I really want to help you create space for creative self-care moves that can change your life in real + doable ways. Come along for 14 days of creative play as we take back the gray days of February and fill them with color. Because playing with color opens us up to the beauty and joy around us. Because we live in a time where the overwhelm can feel tangible, and we need go-to practices to get us back into our hearts (and this course is filled with some easy to add in practice ideas). Because creativity is a form of self-care, and self-care can free you to show up as your whole self. Because you deserve to have a little fun over there in your corner of the world. When you come along for Tell It: Color, you choose the medium you want to play with (more on that below!) and I'll provide prompts, inspiration, ideas, and connection during our two weeks together. Here's how it works: You'll gather up the supplies you need for the way you want to play along plus a journal and a favorite pen, and I'll provide prompts, stories, inspiration, and community. And then we’ll meet in a private Facebook group and on Instagram to share our creations and stories each day. I'll also share peeks inside my Tell It: Color journal + a few other colorful practices I use and how creative play + mindfulness help me each and every day. AND if you just want to join in without choosing a medium, there will be plenty of creative ideas in each day's email for you to use for your daily creative act. 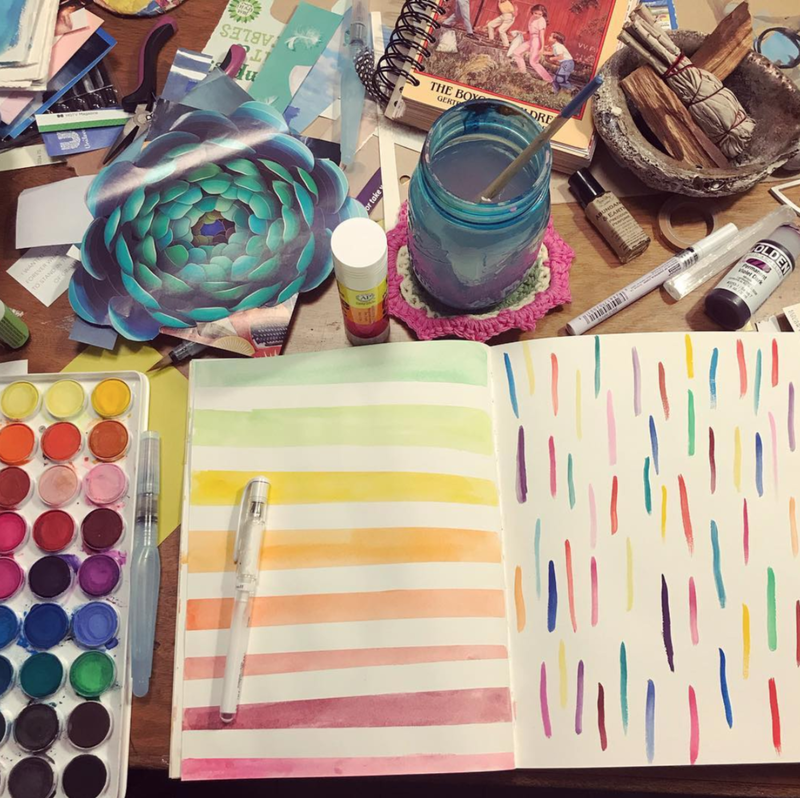 OR if you're really longing to play with some art supplies but don't know where to begin, pick up some watercolors and an inexpensive watercolor paper pad and come along! Daily emails: During our 14 days, you'll receive a daily email from me in your inbox. There will be ideas about capturing color through our chosen medium, and ideas about reflecting and writing the stories that rest in those colors. Every day will be about connection and how we can create space for inspiration and curiosity in our daily lives. Facebook group: An optional private Facebook group that gives you a space to connect with like-minded souls as you share your Color stories. We’ll also connect on Instagram via a hashtag, which is a fun and easy way to share and meet others in the course. Bake a cake and decorate it with the color(s) from the prompt. Gather up a collection of items that are all one color and photograph them. Paint with watercolor one day. Make a meal that celebrates the color(s). Gather up crayons in shades of a certain color and play in a coloring book before bed. Choose your daily outfit based on the prompt. Make a list of everything you can think of in that color. Write down a memory that connects to that color. Buy flowers and create different mandalas each day. The most important piece is that you're creating space for creative play and self-care in your daily life. Yes. Yes. Yes! Register and join in RIGHT HERE!